A French Country Thanksgiving table setting sets the stage for a traditional French Country recipe, Coq Au Vin, for you to cook for your family during the Thanksgiving holidays. Welcome to my French-inspired home for ideas for your family to Gather 'Round The Table this Thanksgiving holiday. 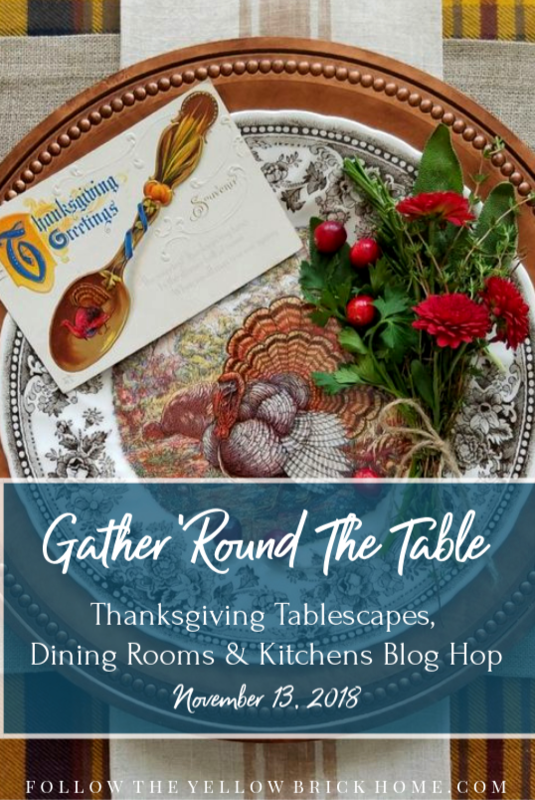 In this season of thankfulness, I am grateful for Amber at Follow The Yellow Brick Home for hosting a Gather 'Round The Table Blog Hop for 20 of our blogging friends to share ideas for Thanksgiving with all our readers as you prepare for your family's celebration of the holiday. If you are coming from Rosemary-Thyme, I so glad you are here. Be sure to see the links to all of the other Gather 'Round The Table ideas for Thanksgiving at the end of the post. Coq Au Vin is a traditional French recipe made using chicken thighs and legs for a new recipe for your family Thanksgiving meal. But, if your family insists on a traditional Thanksgiving meal, you can adapt the Coq Au Vin recipe to use any poultry leftovers for the day after Thanksgiving. No dried out leftover turkey sandwiches. Instead the recipe makes a moist sauce great for sopping up with freshly-baked rolls. Serve with a fresh salad, and you have a delicious day-after Thanksgiving meal. A link to a Coq Au Vin recipe is at the end of the post for you if you are game for a hearty meal with a wine-based sauce. 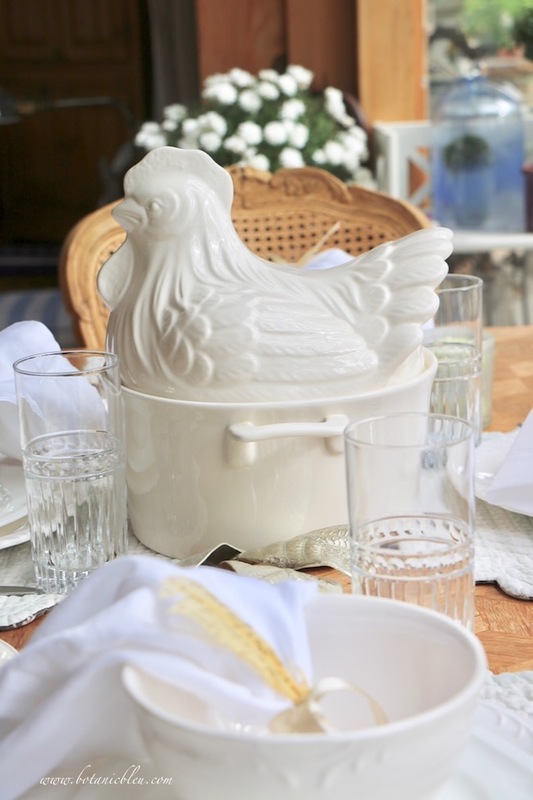 What better way to set the stage for your French Country meal than to serve the Coq Au Vin in a rooster soup tureen? Coq Au Vin is a one-dish meal perfect for serving in a covered soup tureen. The lid helps keep the recipe piping hot as everyone gathers around the table. A simple one-pot meal calls for a simple table setting, but simple does not mean plain. 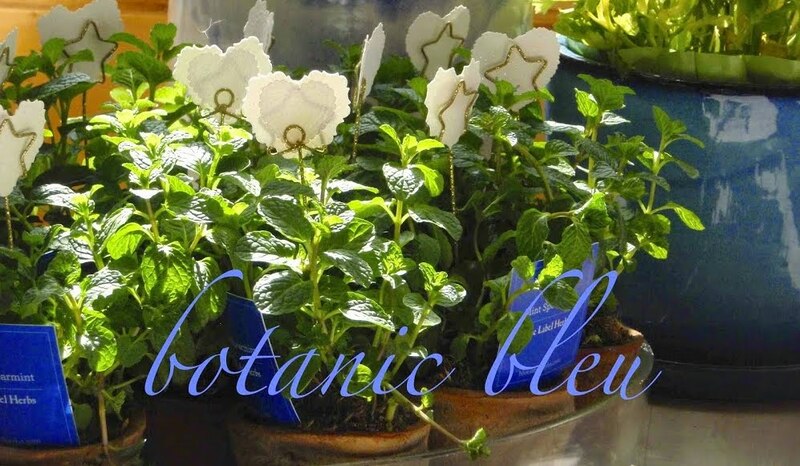 Use your good silverware, placemats, pretty dishes, and a spray of champagne-colored shiny leaves as a base to the tureen centerpiece. A soup bowl for the Coq Au Vin and a salad plate for the green salad are stacked for saving space on a small table. In the USA we most often serve salad as a starter course, but in France, salad is most often served following the main dish. In this place setting the bowl is used for the Coq Au Vin, then removed from the table. Then the salad is served on the salad plate. 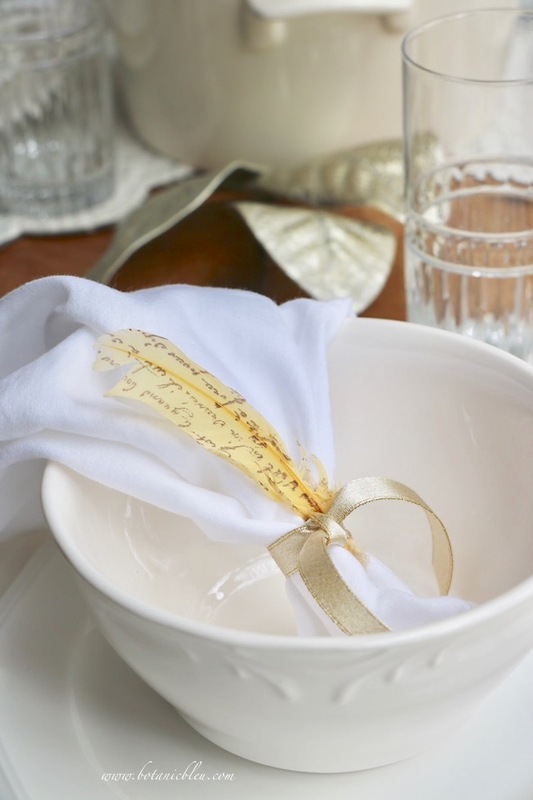 A feather printed with French script is a nod to both the French recipe for Coq Au Vin and the American traditional Thanksgiving meal of roasted turkey. See a link at the end for how I created these French Script Feathers. 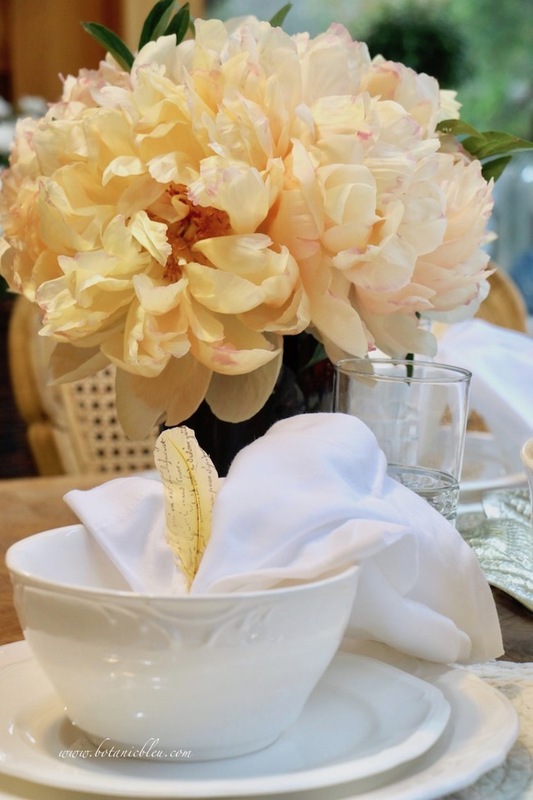 Fresh peonies provide traditional Fall color to the table. 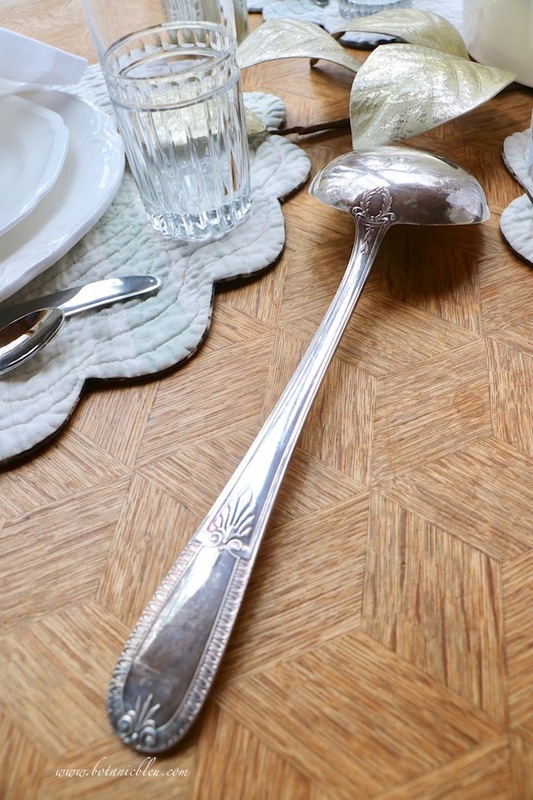 A silverplated vintage French ladle for serving the Coq Au Vin is face down to show the beautiful back of the ladle. I found this ladle at the Place d'Aligre flea market in Paris, France several years ago. The ladle was one of several French flea market finds offered in my very first annual French Country Christmas Event, but did not sell. I decided to keep it. One thing I use to help me decide whether or not to offer an item for sale is whether or not I would love the item in my own home. 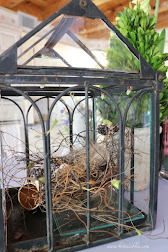 And when an item has a French Country connection, I know that if an item does not sell, I will love to keep it. 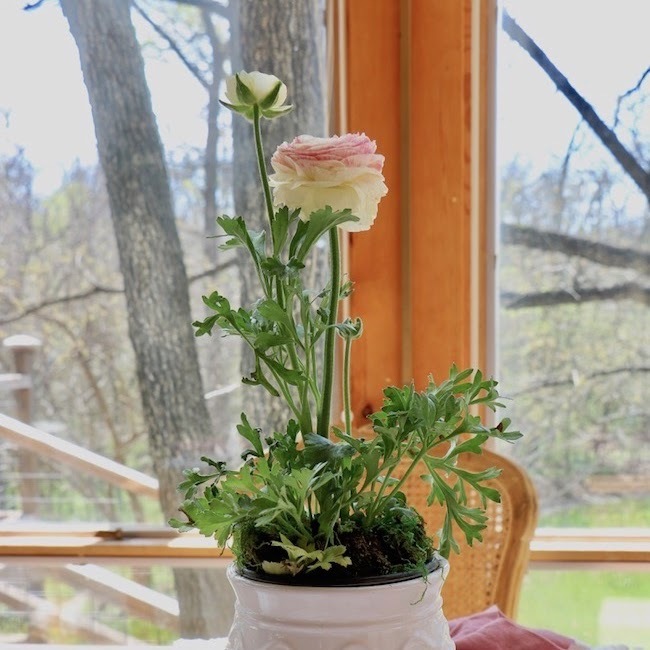 When setting a small table, there may not be enough room for flowers on the table. Since the peonies made the table seem crowded, I removed them. 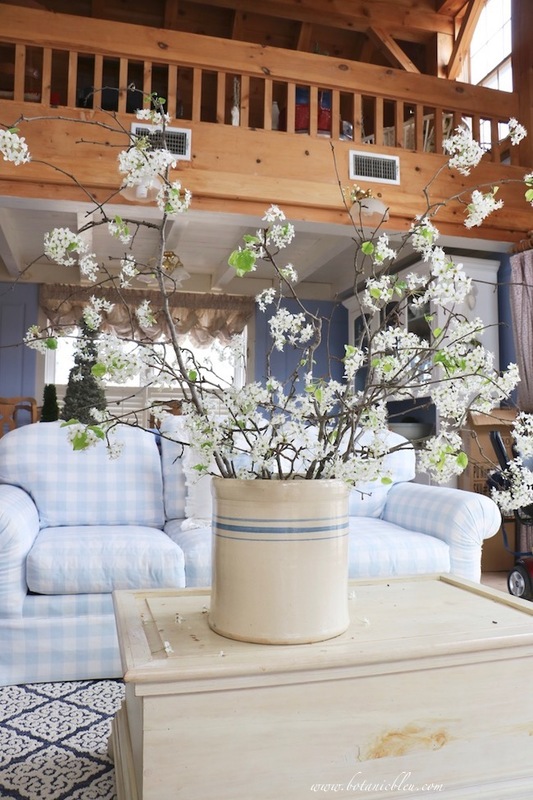 Keep in mind you can use fresh flowers in the room someplace other than the table. 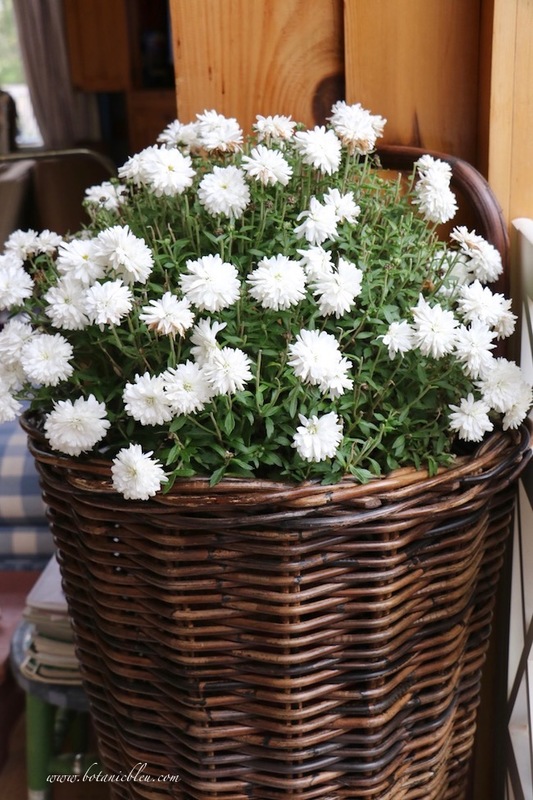 A French Country flower/market basket holds white chrysanthemums in the breakfast sunspace with the table. 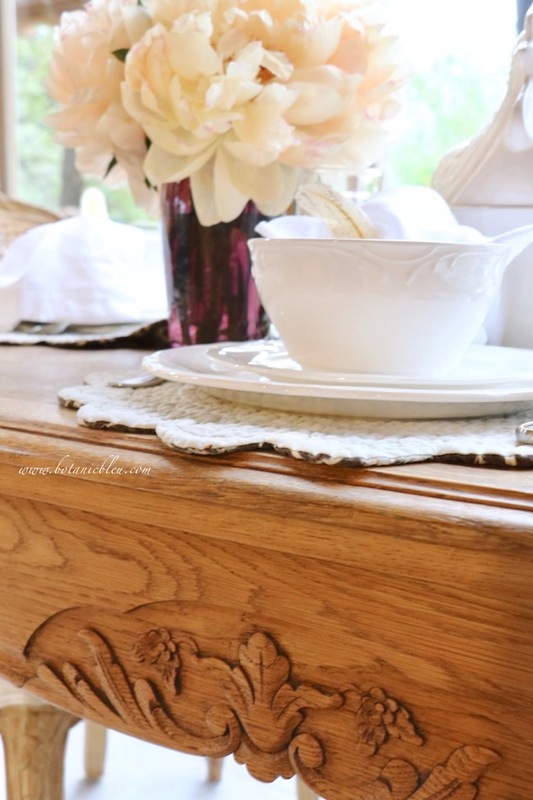 A simple French Country table is a great place to serve a delicious French meal during the Thanksgiving holidays, either as the main Thanksgiving Day meal or as a day-after Thanksgiving lunch. Simple, but not plain, ideas filled with French Country inspiration for a new Thanksgiving tradition at your house. More great Thanksgiving ideas are coming your way. Next up is My Thrift Store Addiction. Be sure to see all the posts for more wonderful ideas for celebrating Thanksgiving with your family this year. Thanksgiving Gold and White Table shows another table setting for Thanksgiving. 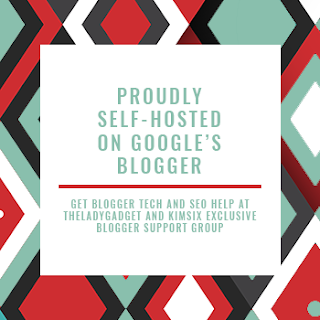 Please PIN ⥣ to share with your friends. What a beautiful tablescape Judith! I can't wait to go over and see how to make the feathers. I am in love with your table. I am loving the feathers and want to make sure I don't miss how you created those. Very inspiring. I love your rooster. 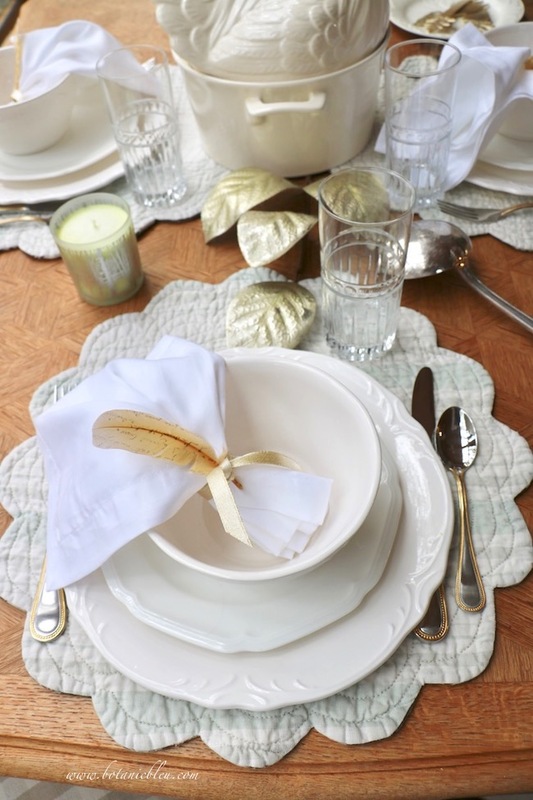 The feathers are adorable and look fabulous on the white china. 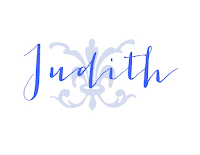 Judith, it's so nice to 'meet' you for the first time via the blog hop! 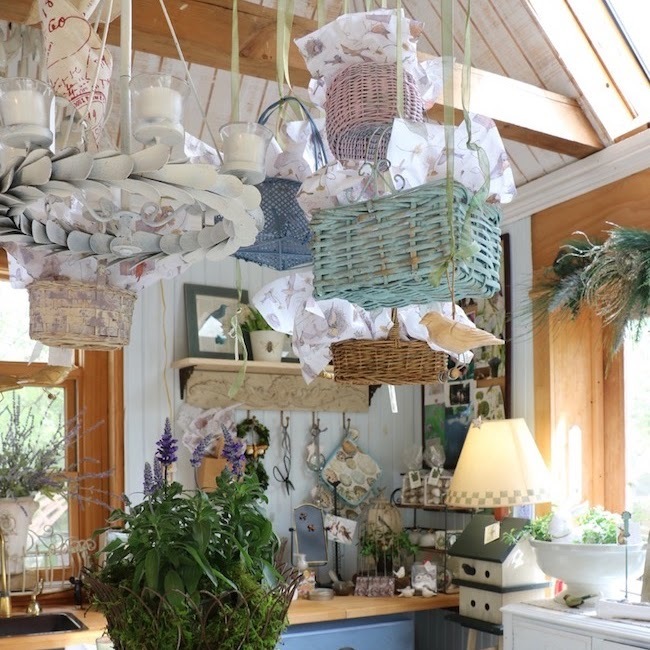 I love all your French country decor and tableware. My own French great grandmother's vintage crystal adorns our table. 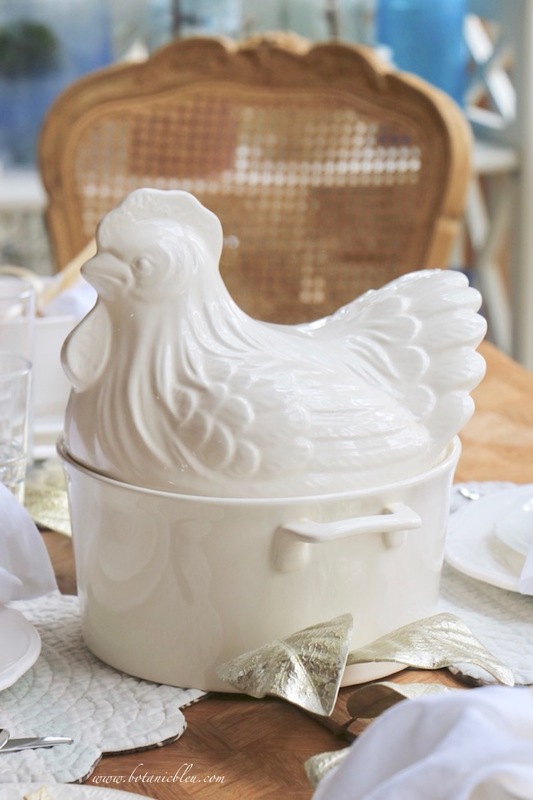 I have a large white stoneware, covered rooster casserole packed away until spring. Will have to pull it out and make your recipe. Really thought the feathers were a lovely touch. Pinned! I adore your French Country dining space with a view!!! Your table is so pretty, Judith. Setting the table under those beautiful windows is such a great idea. I'd love to sit there with you. What a beautiful table, Judith! I love your soup tureen with matching serving pieces. I've always found it interesting that French silver has the pattern on the back side of each piece. Glad you kept your soup serving piece, it's so pretty! Enjoy Thanksgiving with your family! Very pretty all in white, Judith. I adore your ladle's bask side. I have purchased a few from a French dealer with beautiful designs on the back. Leave it to the French for such detail! I loved reading all the interesting background information you provided and how you introduced a fun Thanksgiving custom. Lovely! Ok, now I am drooling. This meal sounds soooooooooooo good and one I will definitley make. 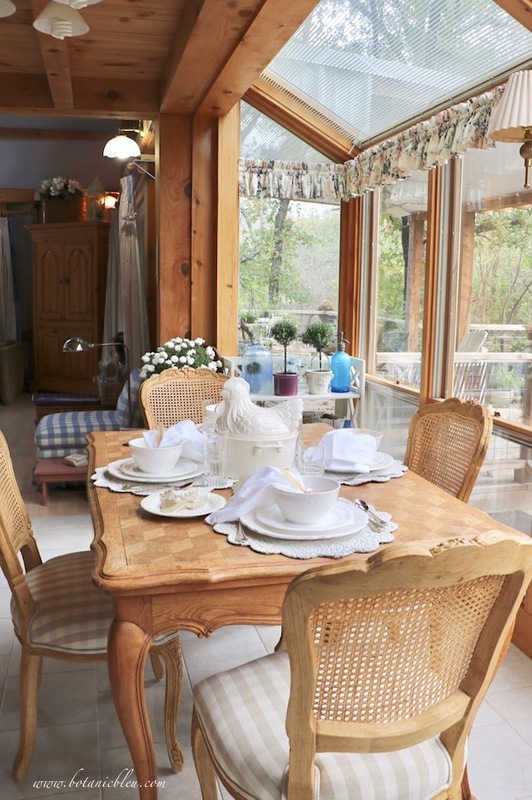 Your table is set so beautifully and the beautiful bay window just makes it even more beautiful. Oh my goodness Judith it is all simply lovely! You know I am loving the French touches! I love the idea of having fresh flowers around the room for Thanksgiving! Your dining space with all the natural light is dreamy. I am glad you decided to keep the French ladle. I use the same criteria for deciding whether or not to buy an item for my booth. I am so happy to have you hopping along with us again. Have a beautiful Thanksgiving! 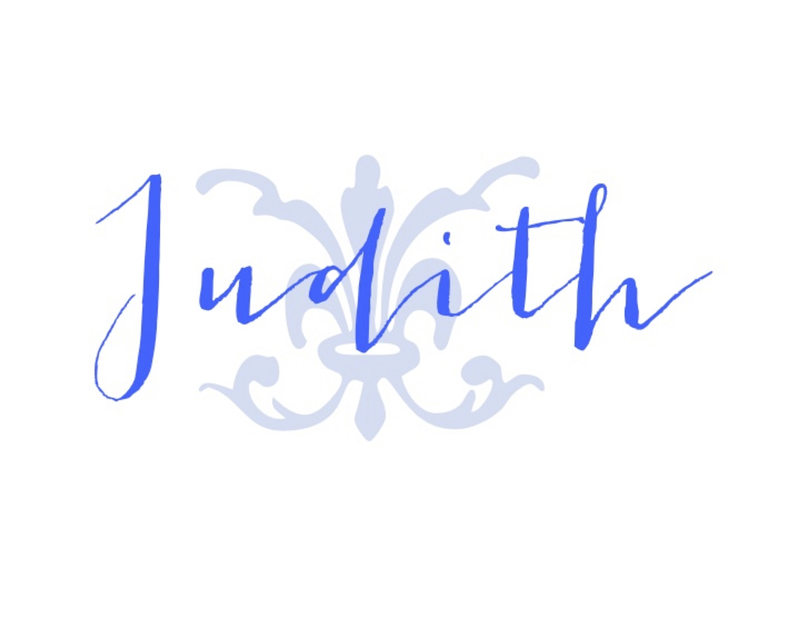 I love your french script letters, Judith! What a wonderful idea. And thanks for the cultural french lessons; I had no idea they had salad after! Have a Happy Thanksgiving! 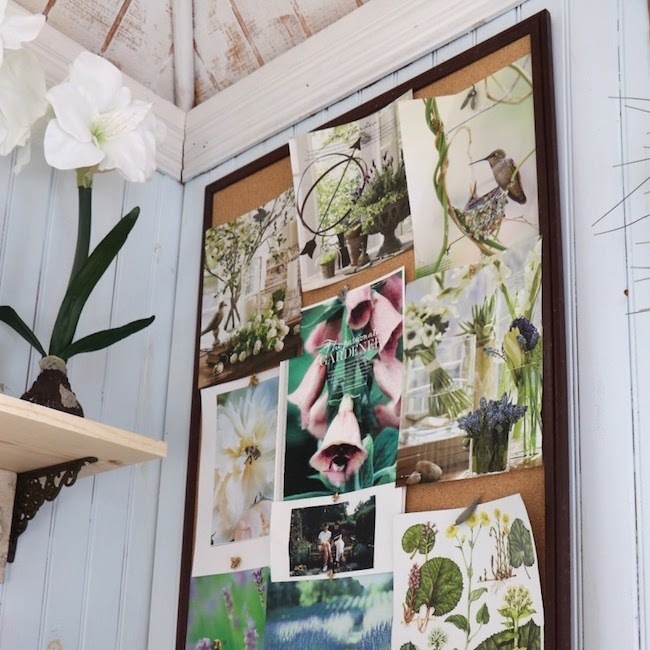 Judith, your tablescape is gorgeous! Thank you for sharing the traditions around serving Coq Au Vin - I always enjoy reading about different traditions around the world, and this one has a very hygge feel to it, which I love! 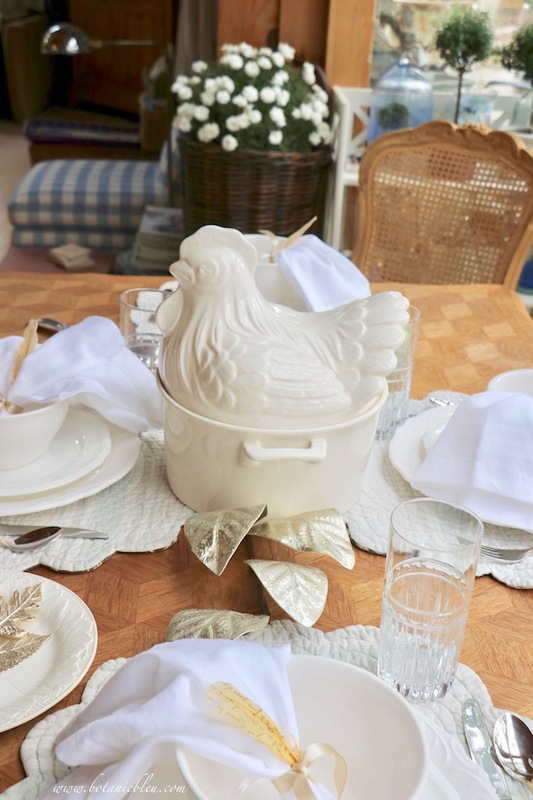 The rooster tureen is perfect, I love the quilted placemats, and the scroll plateware is perfect! So happy to be hopping with you! I am absolutely in love with your dishes!!! Judith, everything is so pretty! I love the white dishes...and that ladle is exquisite! I love silver pieces mixed in with white dishes. Different pieces always add depth to the table. And those peonies...OH MY GOODNESS...wherever did you find them??!! So beautiful! Happy Thanksgiving to you and your family! Love and hugs! I adore your neutral table with the white dishes! 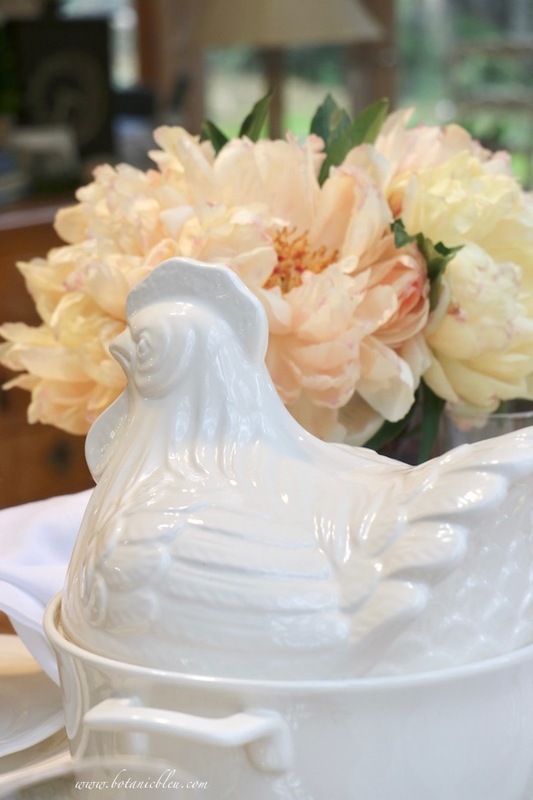 Love the rooster tureen as the centerpiece! Wishing you a Happy Thanksgiving! Oh, Judith, how I would love to be a guest at this beautiful and elegant French Country table. I adore the soup tureen. I have a similar one that my mother gave me that she received as a wedding gift. I hope that you have a Happy Thanksgiving!! !